CINCINNATI, OH--(Marketwire - Feb 19, 2013) - The recent grand opening celebration of Roosters Men's Grooming Center (MGC) in Mariemont included a donation of $250 from the store owner Dub Nelson and wife Lisa to the Mariemont Civic Association. The check was presented to Mariemont's Mayor Dan Policastro, and the funds will be used to help provide scholarships for underprivileged children in the community. "It's important for Roosters and for our family to take an active role in the communities we serve," said Nelson. "My wife and I have five children and two grandchildren, and we welcome the opportunity to make a difference in children's lives." Located at 3912 Miami Avenue in Mariemont, Roosters MGC held a three day grand opening celebration that included the official ribbon cutting with Mayor Policastro along with representatives from the Cincinnati USA Regional Chamber of Commerce, and Roosters' executive team and staff. 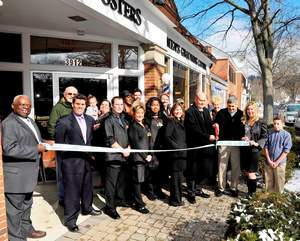 Roosters MGC in Mariemont is the second store to open in the Cincinnati area. Nelson opened the first in Mason nearly two years ago. Visitors to the grand opening were invited to relax in the store's oversized leather barber chairs and select from a variety of custom services from Roosters' barbers and stylists. These include precision haircuts and shaves with hot steam towels, deep cleansing facial massages and moisturizing lotions. "The warm reception we've received in Mariemont is the same experience we want our customers to feel whenever they walk into Roosters," added Nelson. Roosters MGC is open from 9 a.m. to 8 p.m. Monday through Thursday, 9 a.m. to 7 p.m. on Friday, 8 a.m. to 5 p.m. on Saturday, and 11 a.m. to 4 p.m. on Sunday. Appointments are available by calling 513-561-7642, and walk-ins are welcome. Roosters MGC in Mariemont is one of nearly 60 franchises nationwide. The first Roosters was opened in Lapeer, Mich., in 1999 by Master Barber and Founder Joe Grondin, who strives to give customers the best in men's personal grooming services. Roosters MGC is part of the worldwide family of Regis companies. For more information, visit www.RoostersMGC.com. Mayor Dan Policastro of Mariemont, OH, in front at right, assists Dub Nelson, owner of Roosters Men's Grooming Center, with the store's official ribbon cutting.